Today’s mission: we set out in search of the perfect baguette. We ended up doing pretty well on that front, it wasn’t perfect, but it was mighty tasty. As were the other pastries we sampled. We walked through Luxemburg park and enjoyed our food finds on our way to visit the Paris Catacombs. By far the coolest “touristy” thing we have ever done or visited. You start your way down a very long spiral staircase and hike through empty corridors for distance, long enough to start having you think, “where are the skeleton’s, there are supposed to be skeletons!” But once you come upon them, it is striking just how many bodies were moved into these passages. This is the underground network of caves and corridors from an old limestone quarry which is now home to millions of human remains. Millions. Later in the day we finally met up with Ethan and Liz, had a lunch involving more crepes. We walked around the island where Notre Dame sits, visited the crypts and set out to find this Berthillion ice cream shop Liz remembered. The shop itself was closed, but many vendors in the area sold the rich dessert. Mark and I both opted for the “salted buttered caramel” flavor. It was almost a little too salty. I glad we spent most of the day walking, with a diet consisting mainly of pastries, crepes and ice cream for the day. Dinner involved another hike but we were rewarded with good food for our efforts. We had several places in mind after searching menus online. But it turned out our top three picks were closed. Not just for the day or the evening, but they had signs posted that they were closed for the owner’s to go on holiday, for the month. It worked out in the end and I was able to practice some French, although my accent quickly gives me away and I am then spoken to in English. I am helping a friend’s 10 year old daughter with a class project, their GeoBear project. Basically, it’s like the gnome from Amelie, only a little stuffed bear. The bear will feature in a series of photos and I’ll be sending post cards to the class room. In theory, I think I am supposed to send the bear along to someone else who may be traveling further. However, we travel a lot, and if the bear sticks with us, he’ll be getting around. 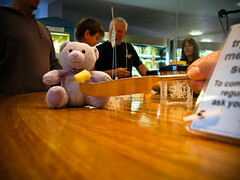 It’s only the beginning for this bear, keep an eye on the photo stream for further adventures and travels! Well, the family visit is over, I’m tracking their flight as I type this. They are safely on their way. 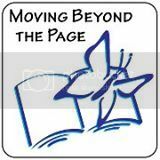 I have a huge back log of blogging but this will be a little place holder for now in outline form. My parents and brother Joe were here for eight days, my folks stayed in our guest bedroom and Joe we stuffed in the dining room at night (we have a small place and two visitors at once is much easier to deal with for space). This was their first trip abroad, so it was a really big deal for them and they had a blast! Day one, was a four mile walk around our village and along part of The Thames Foot Path (the walk and sunshine is key in combating jet lag), tea in Cookham, lounging and recovering from jet-lag watching Vicar of Dibley and then dinner at the 1000 year old, oldest pub in England: The Royal Standard, which happens to be right near where we live. Day two, bagel breakfast, train into Windsor, toured the castle, walked around the Long Walk, around Windsor for some shopping, lunch and cream tea and then home for dinner where we made fillet steaks, baked potatoes and runner beans, and more Vicar before bed. Day three, breakfast of Greek yogurt/muesli/honey/blueberries, train into London, Trafalgar Square, Big Ben, Westminster Abby, Parliament, a ride on the London Eye, trip on a City Cruise with hilarious commentary up to Greenwich where we took numerous silly photos on the Prime Meridian at the Royal Observatory, back home for dinner of our home made pasta with fresh basil, tomatoes and mozzarella. 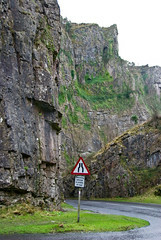 Day four, my awesome eggs Benedict breakfast, Caves and amazing geology at Cheddar Gorge!, lunch at a 500 year old pub, Cheddar cheese made in Cheddar, nice drive through English countryside on the way (through the Cotswolds and Chilterns) seeing all sorts of varying vernacular architecture region to region. Home for dinner, our pork wiener schnitzel and Oreos! my folks brought over for us for dessert. Day seven, after a breakfast of French toast made from left over baguette, we drove into Wiltshire. We went to Stonehenge, Woodhenge and Avebury Circle of Standing Stones, went into Salisbury, toured its Cathedral with the tallest spire in England filled with the tombs of illegitimate children of king’s of England, stopped at Sarum Castle, and found one of the many mysterious White Horses of Wiltshire. Dinner was a night out at the Bel and Dragon in Cookham and topped with some sticky toffee pudding. Day eight, I made home made scones for breakfast with tea before their taxi arrived to whisk them off to Heathrow. We all had a blast, it was a great vacation. There is just so much to do and see, they’ll just have to come back :) Photos will be forth coming with more detailed blog entries on the dates. In the morning I hopped on the bus that took the most circuitous route to the train station around the Sankt Ingbert area. I saw signs for hiking trails and a “Nordic Walking Park” whatever that is. Today I took the train in the other direction to Homburg. I almost want the train rides to be longer so I have more time to see the countryside glide by. There was so much to look at on the bus ride earlier, I didn’t mind that it took longer than walking. I was half tempted to just hop on the train the following day and just go somewhere far. Just to enjoy the trip and scenery. My goal today was to make it to the cave system in Homburg. Since we’ve been finding and visiting so many caves this past year, I’ve started actively searching for caves to visit anywhere new we go. These particular caves are Europe’s largest man made caves. 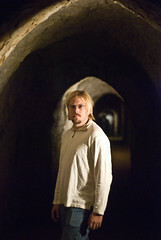 The caves were built between the 11th and 16th centuries and there are over 5km of corridors. And the rock of this region is a vibrant red sandstone with striking striations. These were carved out to act as escape routes from the castle that once resided on the mountaintop. A few remains of stone walls is all that was left of the castle. 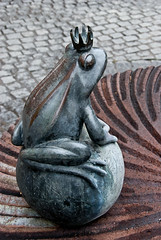 I walked through the town, took photos of some of the many bronze statues that were sprinkled throughout the streets. 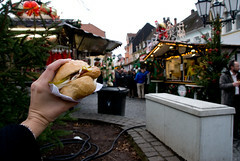 I stopped at their Nikolausmarkt in the marktplatz for lunch. I couldn’t resist a sign for “Homburgers!” This was such a tasty odd sandwich, I wish Mark was there for one, it was that good. It involved a white sausage, breaded and fried on a soft roll topped with onions, pickles and ketchup. Yum! Properly fueled I set off the million stairs that climbed the mountainside in steep switch backs to the entrance of the caves. I had seen on a website (on my phone) that they were open for the first week of December before closing over the winter. Can you imagine my disappointment when I reached the caves to find they were closed for all of December and January! I hiked it back down the hill and had my third crepe in as many days to lift my spirits. I hadn’t been able to find other places to visit in this tiny town. I strolled along the meandering streets for a while before deciding to hop on the train and back to the hotel. 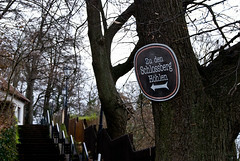 If we are ever near Homburg in the future (and not during December and January) I would seriously revisit just to go to the caves. I get back to the hotel and Mark calls me, saying dinner is going to be in Homburg at a Brewery after visiting some Roman ruins along the way. I make my way back to the train station and after the fifteen minute train ride, I make a second visit to Homburg in one day. I spent one last morning walking around this lovely area. Mark would finish up around noon so I needed to stay close to town. It was sunny and clear, and I headed out on one of the closer trails. It is actually the bike trail (route #2) that goes on for miles and miles in both directions but follows along and stays close to the river Mur. I also bought my yarn for my “scarves made from yarn from countries we visited” project. I found a great little yarn shop. Everything was on sale. Actually it was an “Everything Must Go” sort of sale. Apparently the owner had recently died and the executors of the estate were selling everything off to close down the shop. I bought four skeins of variegated microfiber yarn. I can possibly attempt a hat. A hat! I know! It’s not a rectangle, but I think I’ll give it a go. Mark picked me up and we were on our way back to Salzburg, where we were flying out later that night. We had a few hours to kill before getting to the airport. We parked in what turned out to be the coolest parking garage we have ever been in. It was carved in to the mountain side. Much like the Troglodite caves we visited in Turkey. There were several levels along with long cave tunnels leading to both sides of the mountain. 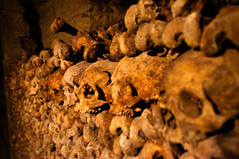 The cave tunnels were lined with elaborate display cases for the shops, restaurants and theaters of the town. We spent some time in the Haus de Natur, the unexpectedly large natural history museum. The ground floor dominated by dozens of well kept aquariums exhibiting living fish, sharks and corals from around the world. Over our amazing dinner, one of the most spectacularly prepared meals we have had in a long time from a randomly picked restaurant, we were thinking we should have tacked on an extra day just for exploring Salzburg. It is a gorgeous city. The shopping district was full of stuff we wanted to buy and we weren’t being harangued and harassed to buy anything. And actually we did buy something, I walked away with a new light weight coat and Mark a suit. This is the hometown of Mozart. We’re not classical music buffs, far from it. 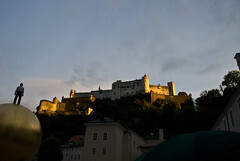 But how cool would it be to take the funicular up to the castle on the mountaintop where concerts are performed. We’ll have to visit here again. We flew into Salzburg and drove through the Alps to get to Leoben. The mountains were towering nearby, we were excited as I had picked a driving route that would take us straight into the Northern Limestone Alps and down into the Central Alps. The Northern Limestone Alps are formed of soft carbonate rocks and although they have steep slopes the peaks are more rounded. The Central Alps consist of hard crystalline rocks like gneisses and shale. These have the characteristic steep slopes and craggy sharp peaks. Even now on a late summer day (well, early autumn now) that was in the seventies and sunny, snow was still capping the peaks. We marveled at how it seemed these mountains just didn’t seem to be high enough to have caps of snow. Amidst this spectacular landscape, on the way to Leoben, we stopped at Eisriesenwelt, the ice caves in Werfen, the largest system of ice and rock caves on Earth, on top of the mountain Achselkopf, about 1575 meters (5167 feet) above sea level. How many caves have we been in lately? 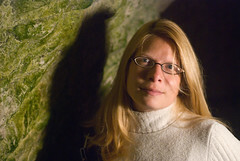 Chalk caves in England, countless Tuff caves in Turkey, now, an ice cave in Austria. These ice caves involved a twisty drive up part of one of the mountains, then a twenty minute hike up to the funicular, which was steep and fast on the exposed mountainside, then another twenty minutes or so further walking up the mountain to the cave entrance. Even at the cave entrance, we could see our breath in the air and we pulled on our warmer clothes to go in. Inside, it reaches freezing temperatures. It takes about an hour to go on the guided tour that takes you in as far as the first kilometer or so of the cave system, and up 700 stairs and back down 700 stairs in a nice loop. There are over 42km of caves in this mountain. Although the caves were known by local hunters, they weren’t “discovered” until Anton Posselt, a natural scientist from Salzburg, did in 1879. As we passed the opening to the rest of the cave system, I wondered about how many spelunkers come to these caves and just how well mapped out the system is. At this point in the cave, we could see equipment used to measure the depth of ice as scientists were working out just how old some of this ice is. We were given carbide lanterns to carry, Mark recognized the smell of the lanterns before we even saw them. The lanterns lit the ice formations eerily as we trekked up the steep stairs built into the cave (so we would could actually get up into the caves and so people don’t damage the ice by walking on it). There is a natural strong wind that builds and is at full strength at the entrance. Wind finds its way into the caves through various small cracks, there is no other entrance to the cave. 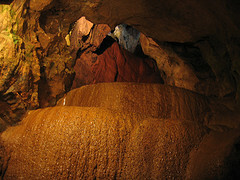 As the air cools it sinks to the lowest parts of the cave system, the wind caused by the dramatic difference in air temperature outside the caves. Before heading back down the funicular, we stopped at the mountainside cafe and enjoyed some frittatensuppe, a beef consomme with strips of the Austrian crepe like pancakes in it. 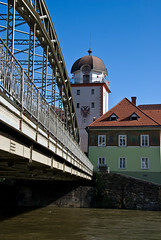 Before us was the panoramic views over the Salzach Valley. The Salzach river below us, milky white with eroded particles from the mountains. First stop today, the famous site of the Three Fairy Chimneys. These “fairy chimneys” are also a product of the geology unique to this region. The thick layers of easily eroded Tuff topped by the less easily erodible basalt results in tapering towers of Tuff with hats of Basalt. Is some places they look rather mushroom like, pale stems of Tuff with caps of darker Basalt. We made our way to the Göreme Open Air Museum, which is a UNESCO World Heritage Site that has half a dozen cave churches and a number of monasteries hand cut into the Tuff. Several well preserved byzantine style churches have walls with colorful Secco’s. Secco’s differ from Fresco’s in that fresco painting involves painting on wet plaster. Secco painting is on dry plaster. The primary color was red ocher made from the iron rich clay deposits found in the area. The colors were mixed with albumin from eggs to set the color. Most of the carved out dwellings we visited had been inhabited until the 1930’s, there was a thirty year period where these places were not protected from looters and vandalism. An interesting bit of vandalism is in the form of all the eyes of Christian secco’s having been scratched out. Muslim’s were responsible for this. Fearing that only Allah had eyes to see into these places that were later used as mosques, also that whole idea of no living things allowed to be depicted in mosques led to scratching out of faces. Our next stop was a visit to a ceramics making place, Kaya Seramik Evi, which was located in a cave. Here the master potters throw clay found in the region, both the red iron rich clay and a smoother porcelain like clay. They painstakingly paint and glaze their plates in traditional Hittite and Iznik styles. The potters are all in the family, passing the trade down for several generations, they even have developed a personal family decorating style, pointillist in it’s detail. After a tour and demonstration of a hand throwing style on a foot powered wheel a volunteer was needed to try their hand at the wheel. I did not hesitate. I’m glad I had the opportunity to throw and feel this clay. Having taken a number of pottery wheel throwing classes, using a variety of clays, it was interesting to compare the the feel and texture to what I was familiar with. The Cappodocian clay was finer than the clay I have the most experience with. It was not quite as smooth and fine as porcelain, but was similarly soft and malleable as porcelain. I really enjoyed myself. I wouldn’t say it was my best work, but it was really fun to do. Mark and I ended up purchasing one of the small family design plates. I think this is a unique souvenir, I will always think of how the clay felt in my hands every time I look at the plate. We drove on, visiting a set of cave homes where people lived in up to the 1950’s. Here these rooms were still furnished as the people had lived there. I think Mark and I could live comfortably in carved out cave rooms. Think of how nice the temperature regulation is, maintaining the same temperature inside year round, feeling refreshingly cool in the summer and pleasantly warm in winter. After dinner at the hotel most of us, meaning everyone but Mark, went out to a Turkish culture night, hosted in a cave restaurant. This involved traditional music and dancing of Turkey and all the alcohol you could drink. The night started out with the whirling dervishes. Their white long robes symbolizes the white cloth the dead are wrapped and buried in, the spinning is a prayer bringing them closer to Allah. Photos were not allowed during the actual performance, I can imagine cameras and flashes would be really distracting. It was also performed in darkness, the white robes illuminated by black lights only. They had a brief bit of whirling afterwards in the bright light for photos. I love the ocean, even if it’s a chilly one. I love lazing around on the hot sand with cool inland breezes washing over me. Today was a beach day. We drove over to San Gregorio, explored the cliffs and caves, dipped our toes and feet into chilly waters and basked in the radiant and glorious sunshine! We also hit Pebble Beach, no not that one, the one with the beach made up of actual pebbles. Odd rock formations with pockets of pebbles that get exposed as the water erodes them open. It was difficult to walk on as our feet sank up to our ankles in pebbles. There were large signs proclaiming, ‘do not take the pebbles!’ Of course with such a sign and proclamation goading me on, I had to take a pebble, or two. *sheepish grin* I know, not very environmentally sound of me to do, I know, if every one who visited that beach took just one pebble… I know, I know… but the temptation was too great. And I have my pebble, or two. (We think we were on the road by nine) Busy, busy day so far. -La Honda to San Gregorio: on U.S. Highway 1�beaches, sealing head, rocky lumps, super neat cave, steep cliffs, unheeded warnings, windy, windy, windy, overcast and beautiful. We had originally intended to head to Monterey to do some sight seeing there but ened up coming back to San Jose from Santa Cruz because we were a little tired, we will take a nap before going out to dinner tonight. Page Run Road was a super scenic route to the coast twisting through the mountains. The height of the trees is unreal, nothing to compare to on the east coast. At the first stop on the Pacific Ocean there was this cave worn away into the sandstone. There must have been a fairly recent fir with the heavy smell of burning wood lingering in the air as we approached the opening. Many people had permanently (or at least until that section erodes or collapses) left expression of love (and other expected nonsense) engraved crudely into the walls. At a later stop we encountered an aloof sea lion popping his head out the whipped up surf, carefully watching us from a safe distance. Subsequent stops for sightseeing progressively got shorter due to chilling breezes coming off of the frigid waters (dipped my fingertips and let the water trickle on my palm above the sand, brrr!). Now we have two oceans under our belts. Calla lilies grew by the road side as if they were weeds. There were fields of artichokes everywhere as well as unidentifiable, undoubtedly interesting produce crops. Drove all about Santa Cruz aimlessly not knowing what we really had there other than finding wind surfing gear shops. I took this opportunity to examine the insides of my eyelids making sure Mark would alert me to any new developments in astounding scenery. When we returned to Martin’s we relaxed and vegetated in front of the television and played a few video games (showing off my extreme ineptitude for video game controls). We then dolled ourselves up for an Indian dinner at Amber, lots of yummy food had by all. I went with a sampler special getting a large variety of appetizers through desserts, having a small portion of five entrees, mmmm� eating well on this trip.